Recently my dog Stella and I were taking our bedtime walk when she began sniffing a bag in a darkened doorway. I didn't want to linger as it was raining steadily, but she wouldn't move on. As I leaned in to lead her away I was surprised when the bag moved and an eye popped open and looked up at me. Stella had found an injured pigeon. Earlier in the winter we had come across a large pigeon sitting in the middle of a sidewalk which you never see. I was worried about the bird for the rest of our walk and returned afterwards to check on him. I was happy to see that he was gone, but then spotted him lying upside down on one of those three foot high walls of snow and trash that we lived with all winter. The image bothered me for the rest of the day so that evening I returned with a bag to dispose of him as best I could. To leave him there just felt disrespectful. 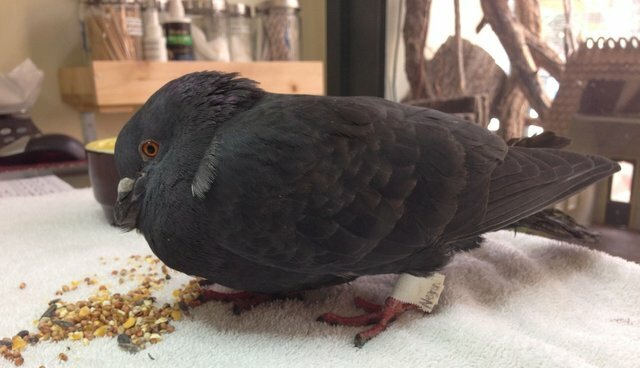 I didn't want pass up a chance to help another bird so after dropping Stella at home I furiously Googled how to rescue a pigeon. Surprisingly, there didn't seem to be an immediately obvious page with steps to take, but after quickly looking through a few '90s style websites and boards I was ready to get to work. I retrieved a broken down box from the recycling and placed inside a bottle filled with hot water and a beach towel over it to make a soft nest. It was at this point that my husband wandered by with a look that asked, "So... what are you doing?" "Injured bird. I'm going to get him out of the rain." He nodded and kept going as if I did this all the time. I returned to the little guy and paused. I wasn't sure how he would react to being picked up and I didn't want to injure him further if he tried to struggle. I finally went for it and gently wrapped my hands around his body. Fortunately, I was able to pick him up and place him in the box without any trouble. We returned home and Stella raised her head to see what the excitement was about. She didn't see any food so she sighed and went back to sleep. But food was my concern also. I wanted some birdseed, but it was after eleven so the local pet store was out of the question. Like most things in life I figured the solution could be found at a bodega so back out I went. After visiting three of them I realized it wasn't going to happen. I returned home and filled a small bowl with sugar water and placed defrosted corn on a paper towel. I had read that pigeons use their beaks like straws so I held the bowl up, but had no idea if he was actually drinking or if I was waterboarding him. "What are you going to do with him?" My husband had returned with a reasonable question. I only had time to figure out how to bring a bird inside. I had no idea what to do next. I didn't know what was wrong with him, but his wing looked injured and his feathers seemed to have tar on them. I clearly needed help. A little more Googling and I found the Wild Bird Fund and emailed them for assistance. I had never heard of them, but it turns out they are "the central resource in NYC for wildlife emergency care and rehabilitation." Early the next morning they responded and asked me to bring him to their office. Navigating the subway from Brooklyn to the Upper West Side with a bird in a box seemed like a sitcom I wanted nothing to do with so I Ubered us a cab. We pulled up the office which had two large windows filled with a variety of birds contentedly sitting on perches. I walked inside and meet Rita McMahon, the organization's director, who immediately took charge and began tending to the little guy, giving him nourishment and pain meds. That tar turned out to be a bird-repellent sticky substance that Rita carefully pulled away from his wings. She suspected he had been hit by a car and scheduled him for an X-ray. As I wrote down my contact info I watched people walk in with more injured birds and even a squirrel. A couple of gulls swam contently in a nearby tank. This seemed like a pretty incredible place and I was surprised it wasn't better known. They're doing terrific work so I encourage everyone to learn about them and make a donation. Rita later emailed that the X-ray had revealed an air gun pellet had broken a bone in his shoulder. It couldn't be repaired and would continue to pain him. He was euthanized while he was still sedated from the X-ray. I was saddened by the news, but took solace that the little guy knew kindness at the end and wasn't in any pain. And that's why I would do it again. New Yorkers love their dogs and cats. Many of us want to see orcas freed from captivity. But we share this city with many different kinds of animals who we see everyday and don't give a second thought to. All of them deserve our compassion.